As a fashion designer, Simon Thorogood�s understanding and approach to the subject has been about extending a fashion framework whilst examining how we can communicate and participate with fashion in a world that is increasingly abstracted and pluralistic. Whilst the language of fashion and clothing is an increasingly complex one, the actual process of designing and creating dress is still carried out in much the same way it has for perhaps a hundred years, largely through a means of sketching on paper, adapting or copying existing garments, pattern cutting or draping fabric on a stand or mannequin. Thorogood sought to question how new notions of designing can be introduced, not to replace but to augment and compliment conventional and traditional methods? 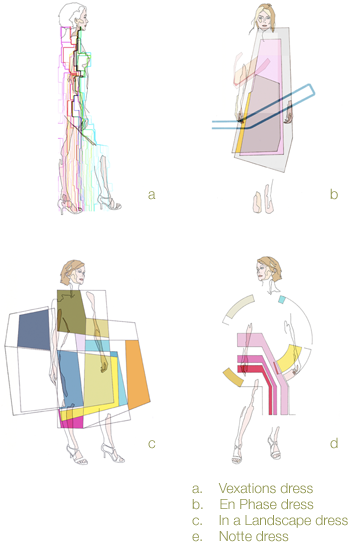 How can new approaches engage and offer opportunities for audiences to participate in novel fashion design processes? Can the experience of participating in design enhance a perception, practice and communication of fashion?